There are very rare places on earth that preserve the pristine ecological values within themselves and show a remarkable harmony between the local population and nature. Silvassa, which stands as the capital of Dadra and Nagar Haveli, is a preserved paradise that derives its name from the Portuguese word "silva" which means "wood". The entire place showcases remarkable beauty, surrounded by the purity of air, like no other place. A home to tribal inhabitants who speak a distinct dialect coupled with Portuguese, Silvassa has earned a great name in history for its beauty well-attested by previous travellers and settlers. Ranging from beautifully preserved ecological landscapes to medieval churches, Silvassa has a lot to offer everyone searching for a peaceful travel destination. Silvassa welcome visitors round the year with its pleasant winters. It experiences warm summers, average rains and cool winters. The best time to visit is from November to June. Winters are the best for outdoor experiences like boating and trekking. The temperature hovers around 28 degrees during winters that give a majestic view of the picturesque setting. Local festivals are celebrated towards the end of December and one can enjoy the famous Tarpa folk dance along with rangoli competitions. The distance from Ahmedabad to Silvassa is around 380 km and takes about 7 hours to travel via road, which is the preferred mode of travel as the sceneries along the route are mesmerising. Beautiful landscapes cover almost the entire route. Whether it is a family trip or a self-ride on a bike, the route is simple brilliant. The preferred route had wide roads, less traffic and runs through the major destinations of Gujarat. Travelling via the Ahmedabad Vadodara Expressway is always a joy for riders as the roads are well developed and well organised in terms of traffic. The city of Vadodara lies about 110 km from Ahmedabad. The former ruling place of the Gaekwad dynasty, Vadodara, is famous for its architectural lineage and mural paintings spreading through its palaces. The famous Kirti Stambh (pillar) portrays the glory of Jainism. Further north lies the Tambekar Wada, which is a 4-storey town house built in the 19th century and portrays mural paintings from the scenes of Mahabharata. The Laxmi Vilas Palace was constructed by the former rulers in the 19th century. The massive palace has beautiful courtyards, a museum, a concert hall and a zoo which delight the visitors. 78 km from Vadodara lies Bharuch. The city is Bharuch is located on the mouth of Narmada river. Sri Swaminarayan Temple is near the highway and is a pristine place to travel. Silent ambience and beautiful surroundings cover the entire premises of the temple and leaves it visitors soaked in spirituality. The food court of the temple premise serves mouth-watering food available at all hours. The Golden Bridge at Bharuch is a 100-year-old bridge and stands as an engineering marvel of the British. Make sure to do the fuel refilling here itself as the next halt is 144 km ahead. 144 km ahead of Bharuch lies Valsad. After the two-hour-long tiresome journey, Valsad is a perfect place to rest. The Tithal Beach in Valsad is a beautiful location to view the sunset. Long beaches are perfect for a walk and to rest on the nearby rocks. Local vendors are everywhere selling mouth-watering delicacies. Further ahead lies the Wilson Hills. The place is called Mini Manali of Gujarat. 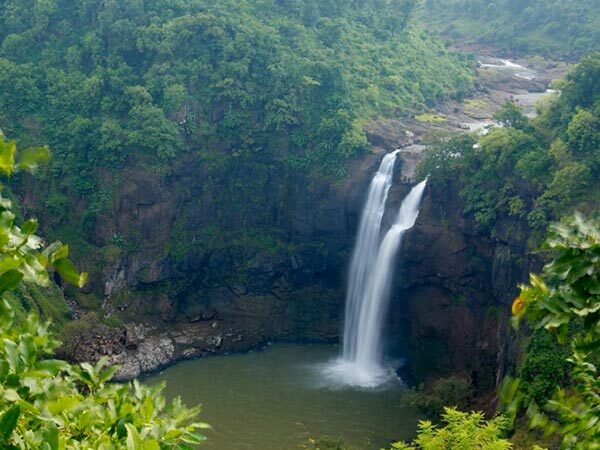 It has a pristine waterfall nestled in the lush green valleys. Wilson Hills is a quiet and undisturbed place where one can stroll deep into the woods for hours enjoying nature. Silvassa is just 45 km from Bharuch. The capital of Dadra and Nagar Haveli, Silvassa was a Portuguese colony known by the name of Vila de Paço d'Arcos. Silvassa hosts a majority of native tribal population and has a considerable number of them following of the Roman Catholic sect. For history lovers and wildlife enthusiasts, this place is a paradise. The century-old church of Our Lady of Piety along with the ruins of Tarkeshwar Mahadev Temple is well-preserved to this date. There is a tribal museum which gives deep insight of the ancient, preserved culture through a vivid display of musical instruments, masks, hunting tools and traditional jewellery. There are souvenir markets selling bamboo crafts, palm leaf mats and Warli paintings, which are handmade by the residing tribal people. The roaring waterfalls, cozy niches and sweeping flower fields also add to the vivid beauty of the place. The church reflects the native style of Portuguese architecture. It is called Our Lady of Piety by the locals. Built in the 19th century, the massive structure has beautifully carved arches, most of which are renovated after the 1912 earthquake, which had destroyed most of its original structure. Located nearby is a tribal museum which is worth a visit to get an insight of the native culture and local values. The lion safari is perfect for wildlife enthusiasts. The lions at the sanctuary have been transported from the Gir Sanctuary. The flora of the sanctuary is truly mesmerising. The dam is located on the downstream of river Damini Ganga and is well known for its water sports during the winter season. The nearby Dadra Park hosts a picturesque lake which is also a famous filming location. The local dish, ubadiyu, which is a mixture of vegetables and beans cooked in an earthen pot, is readily available here. The Vanganga Lake is another famous spot for tourists all over the globe. The nearby Dudhni Dam is an expansive waterfront built on the Daman Ganga river. It also hosts a water sports complex. Luhari is a perfect place to soak oneself in the tranquillity of natural beauty. Luscious vegetation and long green stretches of vegetation are soothing to the eyes. Khavel is 20 km from Silvassa and this place offers views of stunning landscapes with rolling green meadows. The terrace gardens along with pastoral cottages available for stay are perfect places for lodging at the end of the day.